You may have heard that millennials recently passed baby boomers as the largest generation in the U.S. — numbering 92 million strong — but what you probably don’t know is that this tech-savvy group of 18- to 34-year-olds has only just stepped into the early phases of its ultimate buying potential. Researchers estimate that, starting this year, the millennial generation will have more buying power than any other generation in history — spending upward of $200 billion annually. While this alone will have a huge impact on the economy, it turns out that it’s not even half of the story. 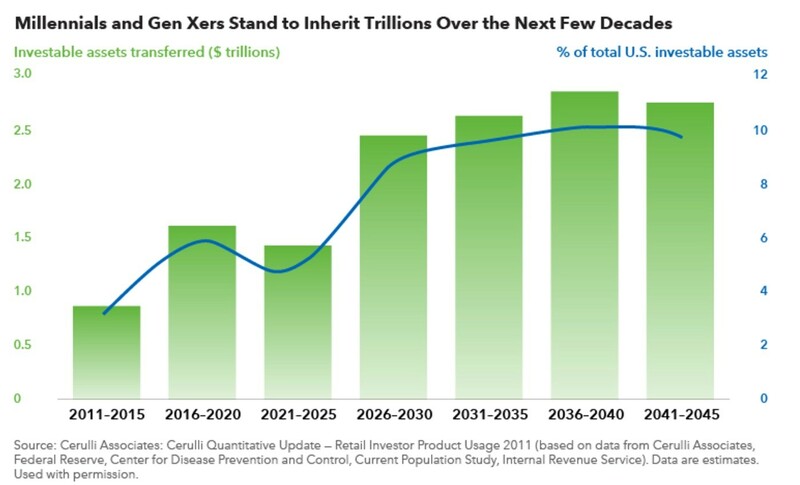 As you can see, millennials are set to inherit trillions of dollars from the aging baby-boom generation over the next several decades. And this massive wealth transfer will play a large role in the types of investments you should have in your portfolio, because what this younger generation chooses to spend its inheritance on will determine the fate of the markets. That’s why I track companies that understand millennials’ consumer needs — and that technology is the way of the future. Those who get in on the ground floor of the Internet of Things revolution will see their stocks soar higher as this new generation floods the economy with money. And for everyone else unable to adapt … well, we all know what happened to the dodo.